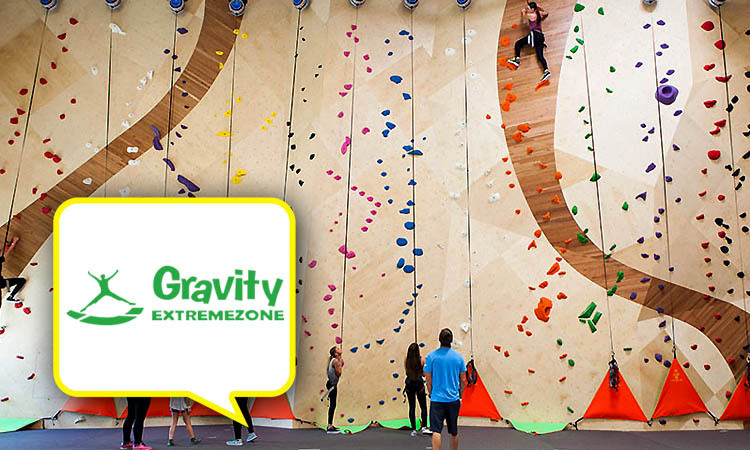 Gravity Extreme Zone is a truly epic experience for all ages. Our 40,000 square foot facility located in Chandler, Arizona has unique attractions including a 30 ft extreme climbing wall, zip lining, bungee, giant trampolines, a height defying skywalk, stairway to heaven, and much more! Ask about our party booths, and large all-glass rooms making it an ideal setting for Corporate events, banquets, team-building, parties & more. 33% OFF 2 Hrs Adventure Park Admission for 6 People ($31.68 OFF of $96.00) Limit one use per group of 6 people. Grip socks are not included and required for all participants. Cannot be combined for a party event. Must sign waiver. Admission includes access to all attractions at the park: Trampolines, Bungees, Skywalk, Extreme Wall, Leap of Faith, Stairway to Heaven, Drop Slide, Virtual Reality, and Beauty Mirror Booth. Tennis shoes are required for Skywalk and Extreme Wall. Must be 5’ (60”) or taller to participate in Skywalk. Cannot be combined with any other discount. To redeem, follow the instructions in the text deal at time of purchase. Deal not valid if redemption code is not presented to cashier.